I was just listening to a self-righteous rant on the radio where a indignant voice was telling the world about how "rich Republicans" were putting non-functioning voting machines in poor districts, and that this is how evil people who clearly don't represent the people like the Satan incarnate currently in the White House. Now, I agree that that that are big problems with voting machines in some districts. The question really should start with who put the bad machines in poor districts. My experience is that it is the people who are in control of the district that have the most control over which machines are in the district. I do agree that political parties are notorious for pulling shenanigans on the public. It is up to the voters to make sure their votes are being counted correctly. As such, It seems to me that if there are broken voting machines in a Democratic majority district, the most likely cause of that problem is the political majority of the district -- the Democrats. Conversely, if there are well working machines in Republican districts, it is probably because the people in that district worked quite deligently to make sure every vote gets counted. My experience tells me that the primary factor in the quality of a vote is the deligence of the people within that district. If the talking head is correct, and there are more broken voting machines in Democratic majority districts than in Republican voting districts. The cause of this problem is more likely due to the Democrats than to the Republicans. The conclusion of the talking head, of course, was that Republicans are putting broken voting machines in the districts that they don't control, and that the solution to the problems was to make a tax that would force rich Republicans to start putting working voting machines in the districts that they don't control. This conclusion was even more puzzling. If the problem is that Republicans are somehow putting broken voting machines in Democratic majority districts, then the proper solution would be for the district to take over the decisions of what machines are in their district. Personally, I think the primary reason that people in poor districts have a harder time getting the vote counted correctly is because the corrupt political machine in their district is not interested in their vote. The existance of districts that do not correctly count the vote is quite troubling. Unfortunately the primary agent in getting the vote counted correctly is the people within the district. Yes, there should be watchdog efforts directed at these districts. Ultimately, the responsibility of making sure the vote is counted correctly is the people within a district. If the problem is that evil Republicans are putting broken voting machines in Democratic controlled districts, the solution isn't to demand new machines from the Repulicans. Repuplicans have already proven that they are evil and corrupt (ne-est-ce-pas?). How could you trust that the new machines work? If the problem is that Republicans are putting broken machines in Democratic Districts, then the solution is for the Democrats to put working machines in their district. I just wasted some time reading the work Darwinian Fairytales by David Stove. This work is a bit closer to the discussion that we should have about Darwinianism than the silly Intelligent Design debate that was the rage last year. The idea that humans should be classified as a primate, or that we descend from an ancestors that apparently branched off other species of primates is an elegant theory that fits in well with the fossil record and all the evidence we have in form of DNA and biology. Noting that man has a common heritage with the rest of the critters on this little blue planet of ours is not a problem. The problem with Darwinianism is all of the philosophical fluff that has been injected into the science of evolution. Darwinianism itself is largely a fusion of Kant / Schopenhauer transcendentalism with with select 19th century prejudices. Arguably, many philosophers have tried to use new sciences to construct new religions with the scientist as priest and the gene as the new diety (the causal agent that manipulates our existence). The real value of evolution is the increased understanding it gives of the make up of the universe. Unfortunately, the beautiful science of evolution is often used as the basis for garbage philosophies. The science of evolution shows us how the life on this world came to be, but it does not completely explain why man is here. We appear to be sitting on a very old planet in a very large universe. The real science of evolution is expanding our understanding our this situation. Philosophies such as scientific determinisms, Darwinism, and attempts to raise science to a religion have detracted from this understanding. As xMission customers, my folks have a small amount of web real estate. So, I made them a small feeder web site (Joe Delaney's Site. This is just a one page bopper with links to other projects. To make the site visually interesting, I put small bars with images across the tops and bottoms of the pages. Now that I have a little bit more bandwidth at my disposal, I might add image bars to my Community Directories. Of course, I will need to check this site on a few different browsers before I make that step. Since bandwith prices have dropped, I have wondered about making the thumbnails larger. Right now, I make the leading edge of the thumbnail 100px. My temptation is to up the thumbnail size to 120px. A year or so ago, I had a post about the need to expand basic research into nuclear energy. This is something that I have advocated for several decades. Yesterday, I watched the CNN broadcast of a Congressional hearing trying to rush the approval of new nuclear plants. Ideas being thrown down on the table included limiting liablity of nuclear power plants, big tax incentives and grants. Many of the financial incentives had political time tables. For example you would get X break if your reactor was running before a specific date. The hearing made me sick to the stomache. Doesn't anyone else see how our political process is destroying fundamental scientific research? Our political system all but guarantees the worst possible outcome. We start in the 50s with big public works projects to put nuclear plants everywhere. We do this before we really know the technology. The result was a great deal of toxic nuclear waste, environmental destruction and unnecessary risk. The politics of action/reaction turned the the US 100% against nuclear development and research. Waving their little Red Books, radical greens managed to drive the best minds from studying nuclear physics and we lose an opportunity to gradually improve the technology. In 2006, a little tiny blip in fuel prices suddenly triggers insanity. Politicians like Bush and Cheney understand the dynamics of nuclear research even less than they understand the dynamics of Iraqi politics. The primary reason I supported nuclear when it wasn't cool to support nuclear is because I knew with certainty that the first blip in fuel prices would lead to the insanity that we are seeing today. Politically driven scientific research leads to the worst possible outcome. The Green movement had successfully sabotaged the development of nuclear energy. That means that we are a good decade behind where we should be in scientific research. We cannot change that fact any more than we can change the fact that Bush invaded Iraq. There should be no politically set time tables for the research and development of the next generation of nuclear plants. While we need to find a way to shield nuclear development from nuisance lawsuits, limiting their liability is silly. Above all, we have to find a way to break out of the politically motivated action/reaction approach to scientific research. BTW, the world is currently in the same situation that we were in during the early 80s. Gas prices were high ... people began investing in conservation while companies invested in increased capacity. Energy prices dropped several years later. Along the way, the little political things done by the drones in Congress only made the peaks and valleys more severe. IMHO, the US is now behind on the nuclear development curb. We should increase research in this area, but are not ready toss up dozens of new plants. Here is a pile of photos from the Bowman Fork Trail in the Wasatch Mountains. The hike was cut short by a rain shower. My new camera takes decent pictures of wildflowers. I will start filling up Protophoto.com with flowers. I admit it would be tempting to start making a guide to flowers (that is including Genus and species info with the pictures). The problem here is that I am pretty much clueless on botany. I haven't a clue about the little flower to the right. The clueless shouldn't make guides. Robert Redford is lending his star power to an initiative called Kick the Oil Habit which takes it cue from President Bush's 2006 confession that the US has an Oil Addiction. The site promotes alternative energy. The site promotes the use of E85, windpower and other alternative fuels. NOTE, the site fails to mention that biodeisel and E85 have the negative effects of making our fuel supply compete directly with our food supply. A massive switch to bio fuels will probably result in mass starvations. Wind Power litters the environment with windmills that our children are likely to find are costly to maintain. Solar Cells run the risk of covering large sections of land with rather toxic pieces of litter. This is all worth pursuing and promoting. There is no perfect energy source (The bicycle gets close, but it is hard to ride a bike during a snow storm). "the planet has already been trashed enough, particularly with the policies of this administration. Excuse me but it's a fact." I agree that Bush has been a horrible president (especially in regards to energy). This is an opinion, however, and not a fact. The real problem here is that Redford leads directly off Bush's admitting that his policies were wrong into a partisan attack. I don't think that making that making energy policy more partisan will end up making sound energy policy. Several times in the interview attacked Bush for secretly setting policy objectives behind the scene without public input. That is fair criticism. However, Robert Redford has been playing the exact same game for decades. The Sundance Summit is a case in point. In this and other initiatives, Redford would have closed meetings with town mayors (hypnotized by star power). In the closed meetings, Redford would set objectives for the town ... completely skirting the step of pulic input on important local projects. My guess is that, in progressive fashion, Redford defines himself as "the public". Therefore public input is achieved when a movie star has a closed door session with politicians to set political agendas for a town. Yeah. Right! I started writing this blog post hoping to praise the Kick the Habit site. Unfortunately, both the web site and the Kick the Oil Habit site are vacuous political hack jobs. The site was designed by The American Progressive Action Committee. The effort seems aimed primarily at making the development of alternative fuels more politically charged than it already is. All of these alternative fuel sources have problems. They should all be developed, but there is no free lunch. Kick the Oil Habit puts forward E85 as the free lunch (E85 is 85% ethanol and 15% oil). Yes, the fuel should be developed. However, this product will put fuel consumption in direct competition with food. It will increase demands on farmland, etc.. Corn is a good source for fuel, but it is not perfect. In the end I have to pan Redford's initiative. Kick The Oil Habit appears to be more about creating partisan division than in working on the most difficult problem faced by our generation. If you want real information on alternative fuels, the National Renewal Energy Laborator (NREL) is a better source. Here are some pictures of the Mill B Trail in Big Cottonwood Canyon. I was just reading an article that talked about how having a dog makes people more active. The odd thing with me is the opposite is true. I used to take really long bike rides and do all day hikes. Being charged with a small chocolate lab I find that the foolish dog dominates my recreational life. The dog demands multiple short walks each day. The really bad part of having a dog is that the dog dictates where I go. I've been wanting to visit the Cottonwood Canyons, but dogs aren't allowed in the canyon. For that matter, I ended up cutting my walk through Mill B canyon short because I had to get home to take the dog on a walk. 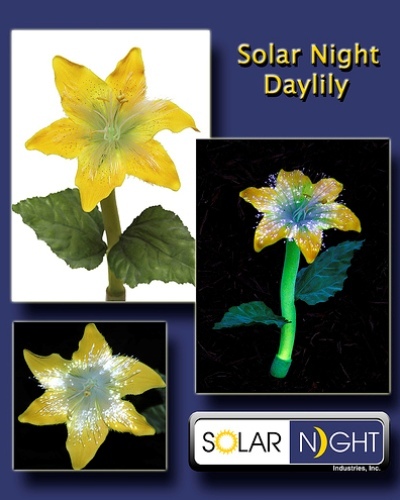 The Solar Powered flower night light is a great present. A solar powered flower! What will they think of next? This site also includes useful solar energy products. I would love to see more solar panels on roofs of houses. I worry about the day when we start covering hundreds of thousands of acres of desert with solar panels and wind farms. Anyway, I just purchased one of these for one of my sibling's birthdays. I've been watching news reports on the manhunt for FLDS prophet Warren Jeffs. Jeffs currently holds the top position on the FBI's Most Wanted. It seems strange that Jeffs would make the top of the FBI most wanted. Jeffs crimes are relatively minor. All he has done is pimp a few teenage girls, commit some fraud here and there, and he's engaged in one or two statutory rapes. It looks like Jeffs' list of crimes is shorter than the first LDS prophet Joseph Smith. The persecution of both Warren Jeffs and Joseph Smith are similar. Basically, people who escaped from the cult got gentiles riled up. (gentiles means everyone who is not Mormon). The gentiles then end up doing the dirty work of chasing down the cult leader. Smith was shot by someone in a crowd. I suspect that the assassin was an exmormon or a victim of one of Joseph Smith's many frauds. We really are seeing a repeat of Joseph Smith's martyrdom. Since the persecution of Smith is central to local (Utah) myths. I can't help but wonder if the manhunt for Jeffs will end up in state lore as an unjust persecution of Mormons. The other interesting thing about this case is the twin towns of Colorado City and Hilldale Utah. In both cases it is clear that the cult leader is intentionally isolating the followers so that the cult leader can have greater influence on the followers. Which brings me back to the second part of Utah lore. The LDS Church invests millions each year in a massiv PR campaign that talks about how Mormons fled the US (Illinois in particular) to Utah. This always puzzles me because Illinois is one of the most tolerant areas in the world. The FLDS clan is just about the size of the Mormon group that migrated. I can't help but wonder if perhaps the great emigration from Illinois was more of an effort to isolate adherents than it was an act of fleeing religious persecution. Personally, I think Jeffs should be hunted down for his sexual crimes. The fact that a pimp claims to be a prophet throws the whole affair into the irrational world of myths. Jeffs will probably not be elevated into a myth because the primary LDS church is better at creating and controlling myths than the FLDS. However, Jeffs actual life is more in keeping with the precedents of Brigham Young and Joseph. Who knows how the myths will turn. I finally broke down and bought a copy of The Professors by David Horowitz. While this book is now where near as good as his biography Radical Son, I find The Professors a compelling look into modern academia. For years and years, I thought I was alone in the perception that modern US schools were dominated by Marxist thinking. David Horowitz provides an insightful look at 101 US professors. Several of the professors listed in The Professors are proponents of an idiocy called "Critical Race Theory." Critical Race seems to hold that the laws white people see are nothing more than an illusion created by our history. Since Hispanics and Blacks, etc., have a different story, our laws simply don't apply. The professors have clearly turning back the direction of classical liberalism which sought to find universal moral laws that allowed all people to thrive. Modern liberalism turns the equation upside down. The goal of modern liberalism is to separate people into dysfunctional groups that are incapable of communicating. The classical liberal hates the fact that we are developing an underclass of Hispanics. The modern liberal revels in such division. There is the great hope that such divisions will lead to a master slave reversal. The classical liberal was someone who truly wanted to liberate people. The modern liberal wants people divided in groups that the intellectual elite can manipulate. We really do have a problem here. There are groups hypnotized by critical race theory who do want to create a society that is divided by law. They would then be able to ride the friction caused by the division to power.